With NAMM just around the corner and many still finalizing their schedules for the busy NAMM week, I want to make sure you know about the great event by Tsunami Cables, Everyone knows if you want to play the best, you get the best with Tsunami Cables. 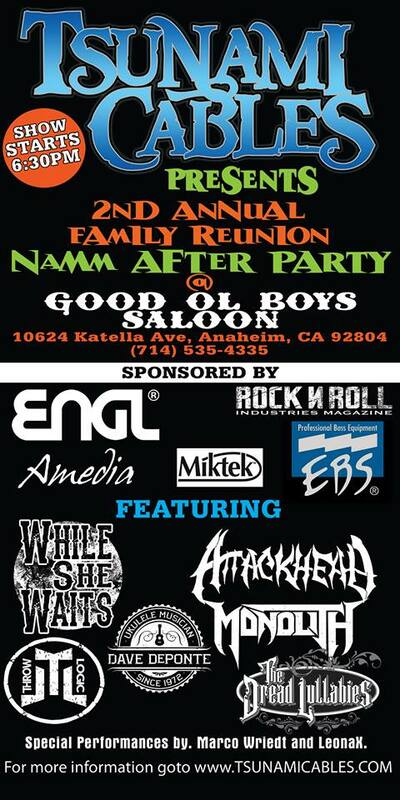 This year, Tsunami Cables is hosting the 2nd Annual Family Reunion NAMM After Party set for Friday, January 24th at the Good Ol Boys Saloon on Katella Ave. The evening is sponsored by Engl amps, EBS amps, Rock N Roll Industries Magazine, Amedia Cymbal Company, and Miktek Audio. Get ready for a great night of music with performances by Throw logic, The Dread Lullabies, Dave DePonte, Monolith, Attackhead, While She Waits, and special performance by Leona X and Marco Wriedt of the German band “Axxis”. The show starts at 6:30 pm and is sure to be a killer night that will have you talking long after NAMM weekend. The Good Ol Boys Saloon is located at at 10624 Katella ave. Anaheim Ca, 92804. The even is open to the public 21 years and older. You can find out more at the EBS Booth 5391 or look for Keith Stickney at the Engl Booth 5824. You just might get one of the 250 “back stage passes” or you can pick up the show flyer. 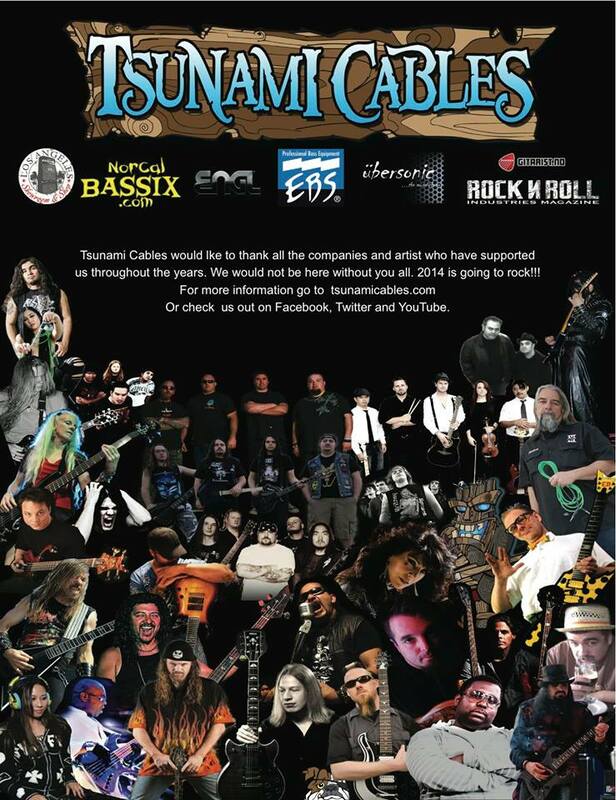 If you are not able to make it out to NAMM and are interested in Tsunami Cables make sure to check out their website at www.tsunamicables.com. Also if you are in the Los Angeles area, you can contact the Engl Showroom for an appointment where you can play and buy Tsunami Cables. Email is EnglShowroom@me.com or phone at (310) 895-8249. Gear Highlight: Incident gTar makes it easy to learn how to play guitar! This week on our new feature, Gear Highlight we focus on an item that isn’t truly gear for bands or musicians per say but definitely is something musical! Allow me to introduce you to Incident gTar which is a fully digital guitar that makes it easy for anyone to learn how to play. We heard about this product when a good friend of ours and die hard music lover, Ben Mitchell told us that he was working at Incident gTar transcribing tabs. It is amazing to see how the product quickly developed and has been turning heads in the music industry. It received a lot of recognition and was Runner-up at Tech Crunch Disrupt NY 2012. It is as easy as docking your Iphone into the guitar body and after loading the gTar app, an array of interactive LEDs along the fretboard will show you how to play. It is amazing technology that will allow users to learn their favorite songs and unlike gaming version,s it has the style and feel of a traditional electric guitar so it will be easy to transfer your learning skills over to other guitars. The iPhone will produce the music as you pluck, as you follow the lights on the frets, make a mistake and hit the wrong note, and it will mute the sound. The gTar app comes with a large library of popular songs and can range from easy, medium to hard mode. I can’t wait to try this out for myself. 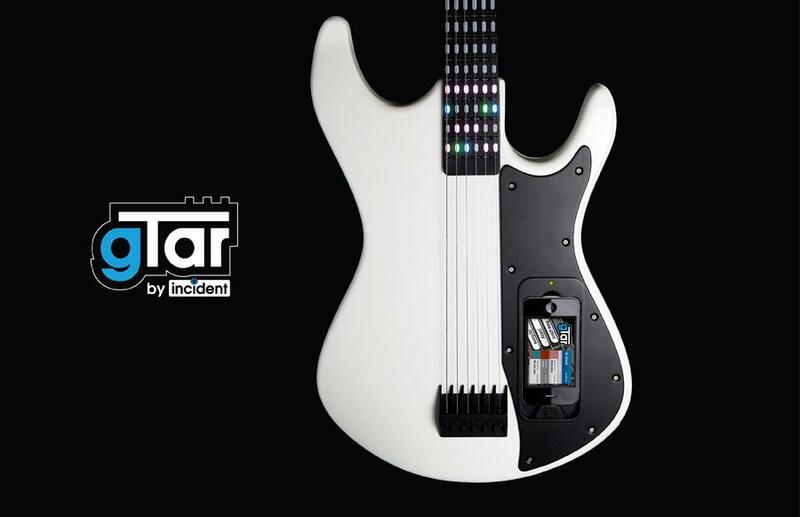 The gTar comes in black or white and is currently selling for $399. You can learn more about this cool gadget on their website http://www.incidentgtar.com/ and also check a video below that shows how it works.